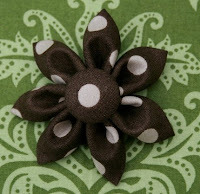 You are here: Home / DIY / Fab Accessories for Classic Paisley and Dots Fabric Combo! Fab Accessories for Classic Paisley and Dots Fabric Combo! I’ve just finished reviewing Little Lesiw hair clips with my little girls. As a children’s clothing designer… I’m always looking for complimentary accessories. Little Lesiw didn’t disappoint! Her clips are amazing! I’m particularly interested in the Pink and Brown collection. Why? I am featuring an adorable pink and brown fabric combo at Shop Childhood. I call it “Classic Paisley and Dots”. Check it out! Fabric is limited! For the full review and contest entry… visit Bookieboo Rave Reviews and Giveaways!